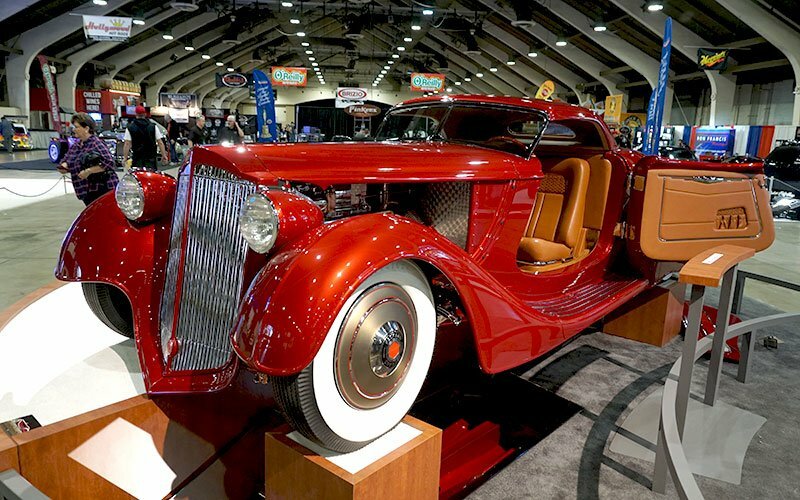 POMONA, CA, Sunday, January 29, 2017 — At the 2017 Grand National Roadster Show this evening, a 1936 Packard Roadster was chosen as America’s Most Beautiful Roadster. 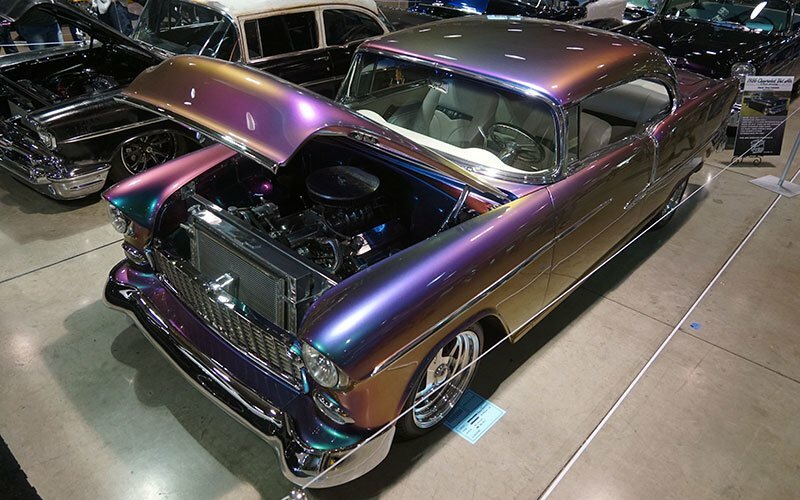 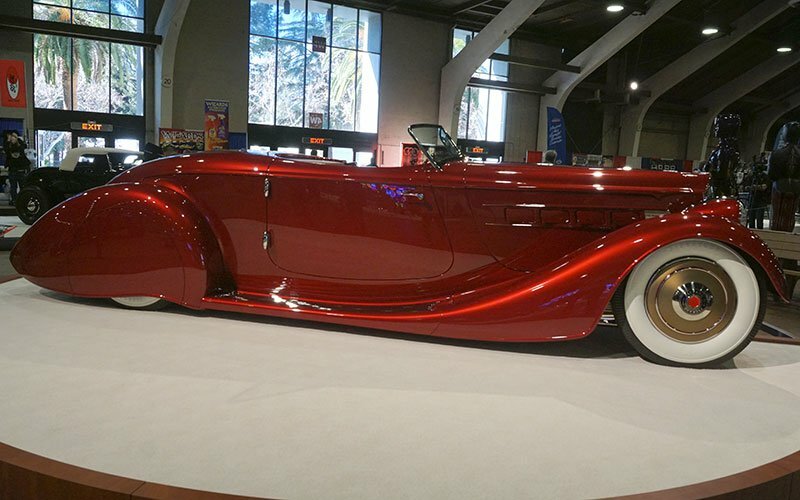 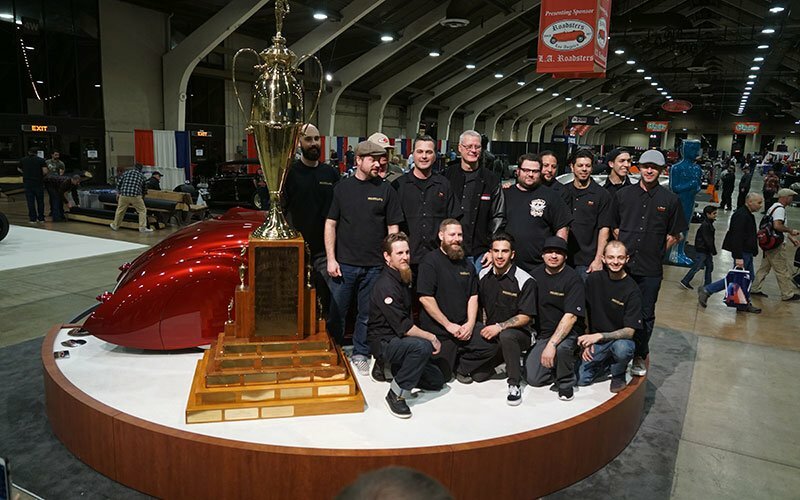 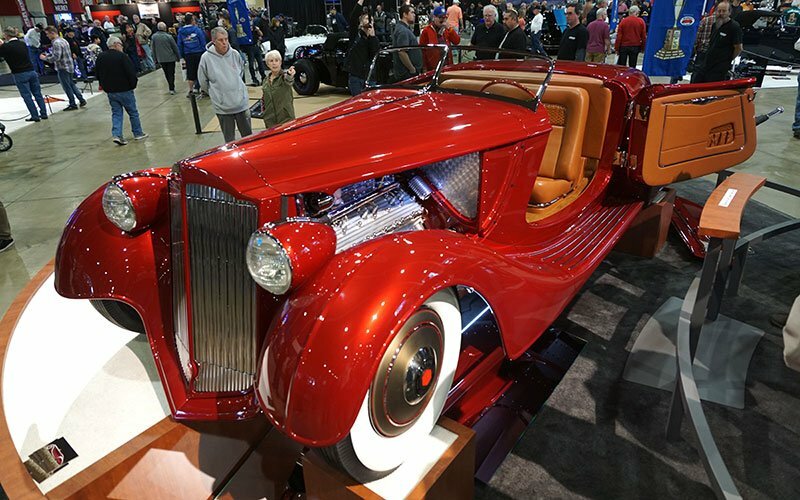 The close of the 68th Annual Roadster Show saw the ten-foot trophy go to the Packard custom creation owned by Bruce Wanta of Bellevue, Washington. 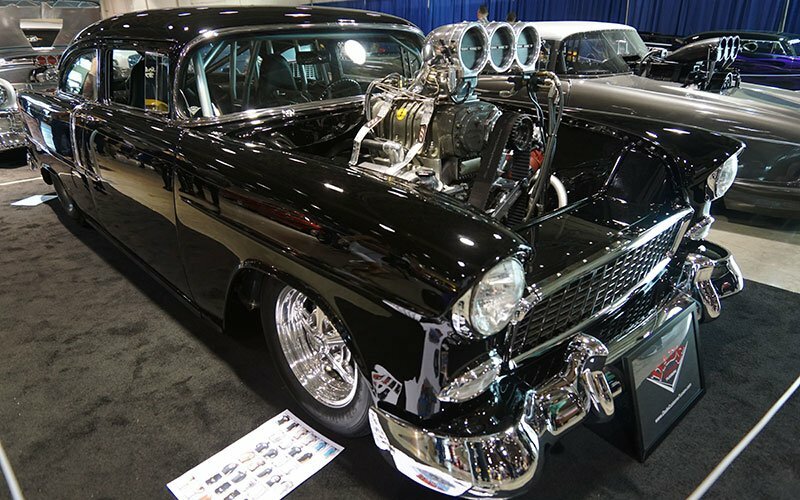 It was built by Troy Ladd and his crew from Hollywood Hot Rods in Burbank, California. 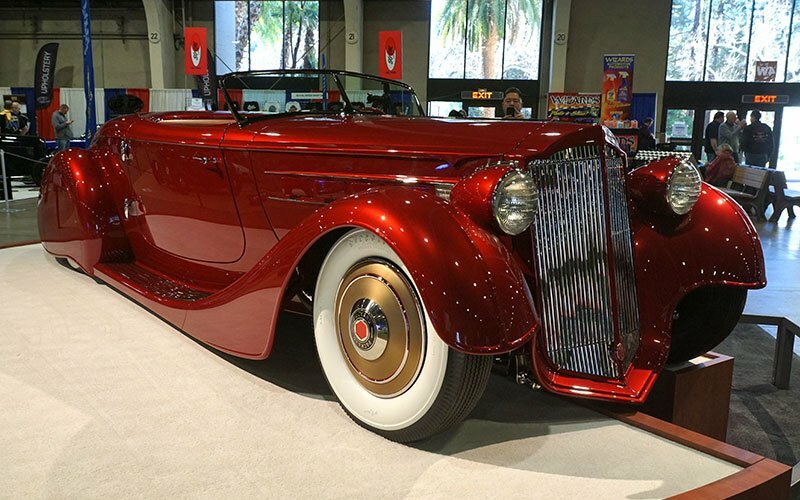 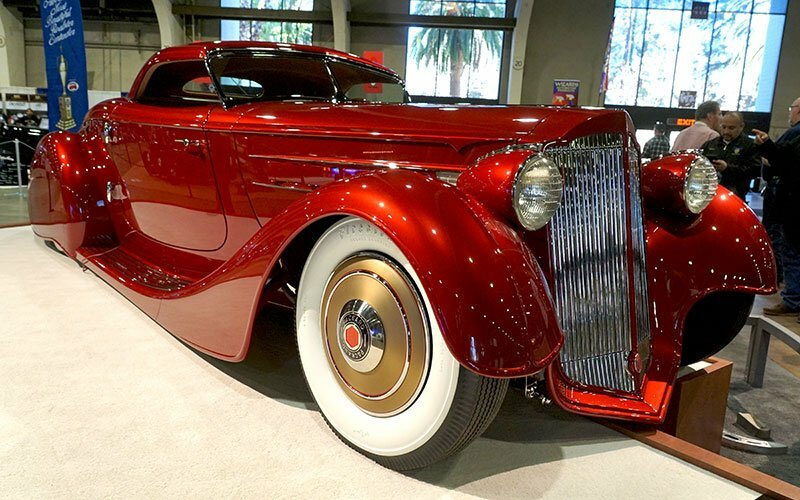 Bruce Wanta’s “Mulholland Speedster” 1936 Packard Roadster. 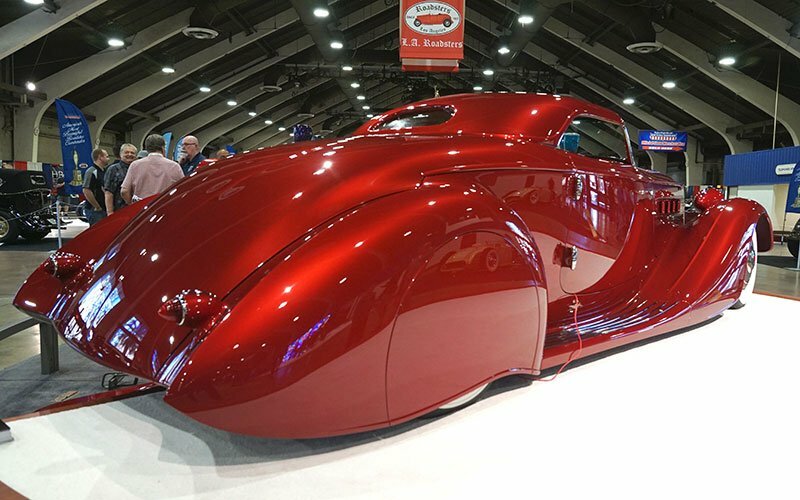 The concept for the car was done by eBlack Design. 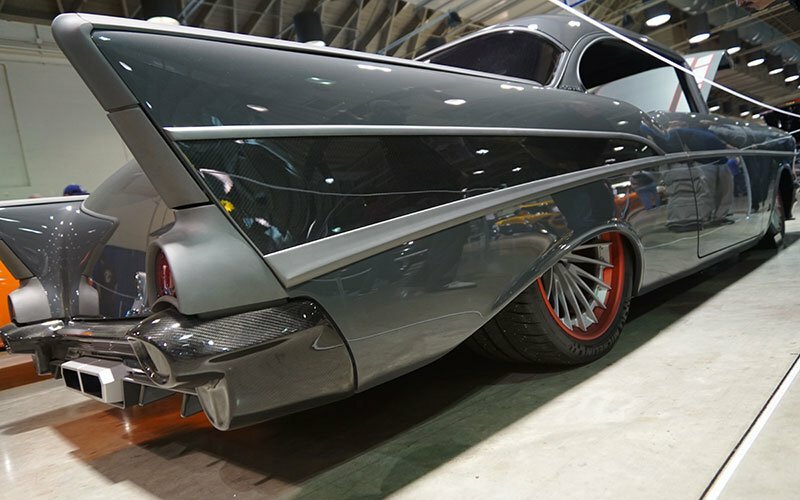 All of the fenders and original lines were refabricated from metal by Hollywood Hot Rods. 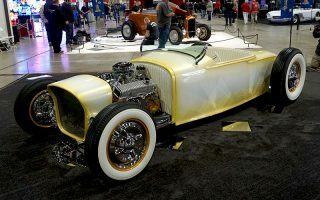 The car was displayed last year at the Grand National Roadster Show in bare metal. 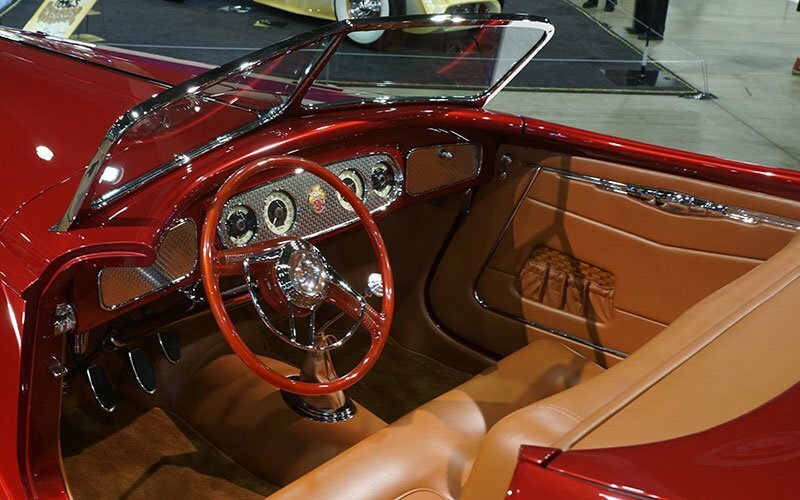 Eleven months later we see the gorgeous results. 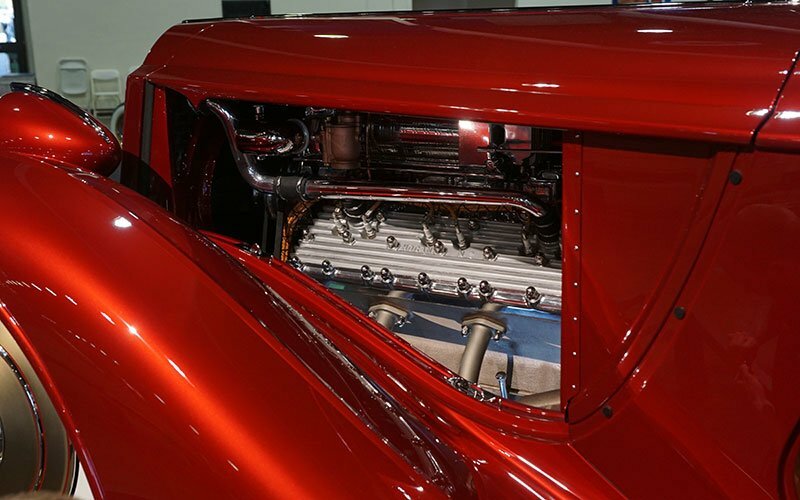 The big V-12 Lincoln engine is fed by Winfield Double D carbs and energized by a vintage Latham supercharger. 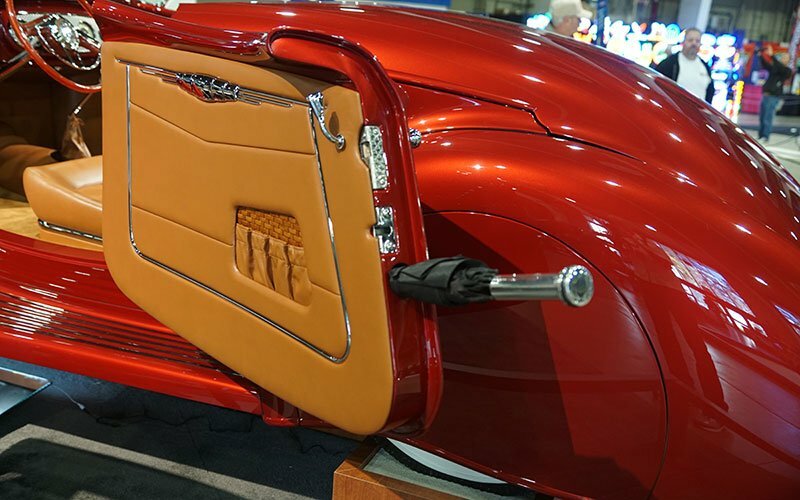 The interior was done in leather by Mark Lopez. 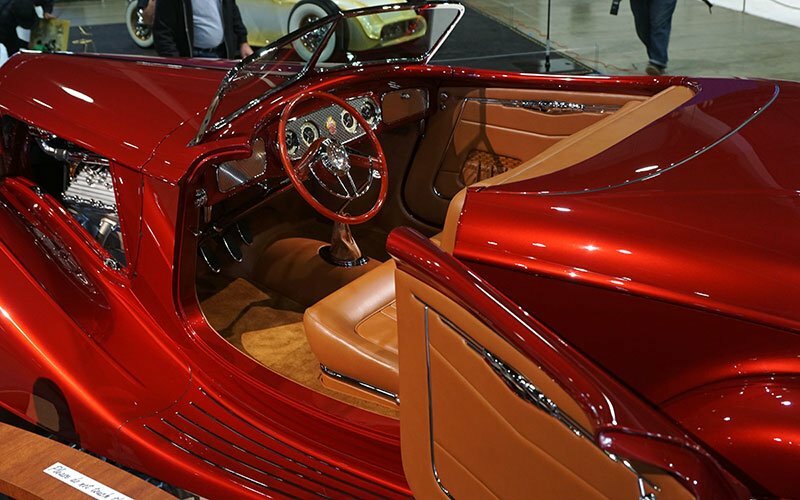 The America’s Most Beautiful Roadster award winner was chosen from a field of 13 finalists. 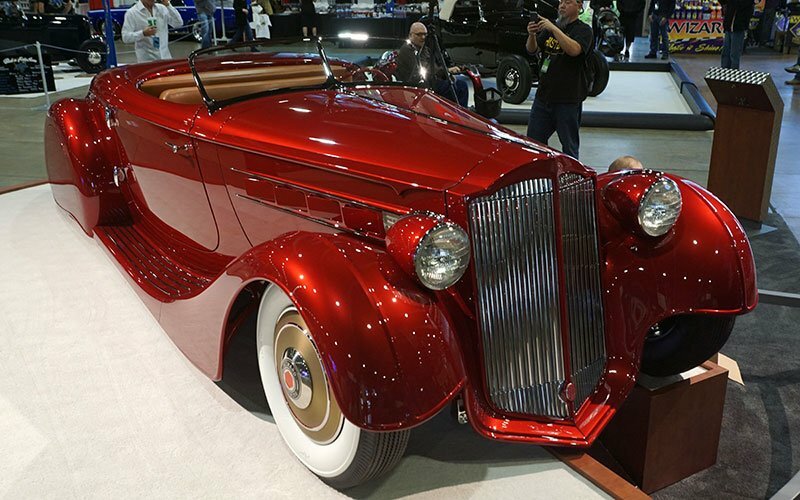 See photos and vidoes of all the top contenders at the America’s Most Beautiful Roadster page. 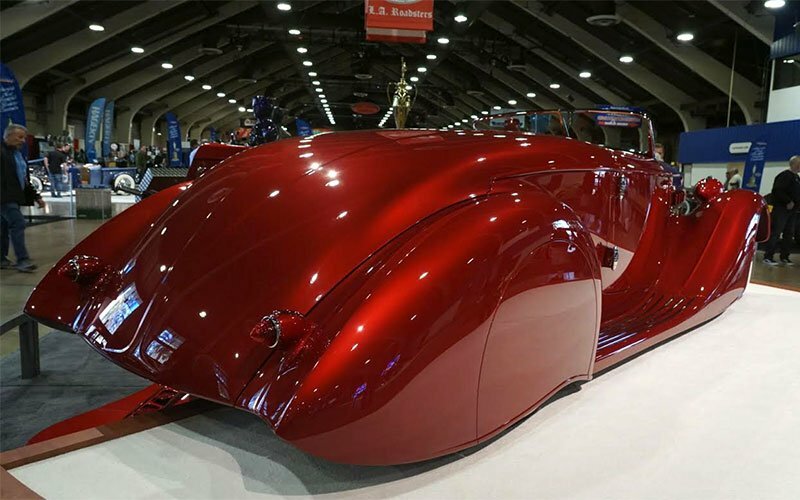 The 68th Annual O’Reilly Grand National Roadster Show ran January 27-29, 2017 at the Pomona Fairplex. 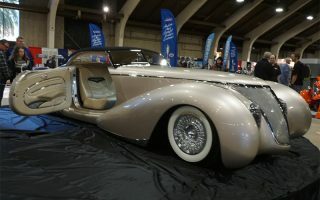 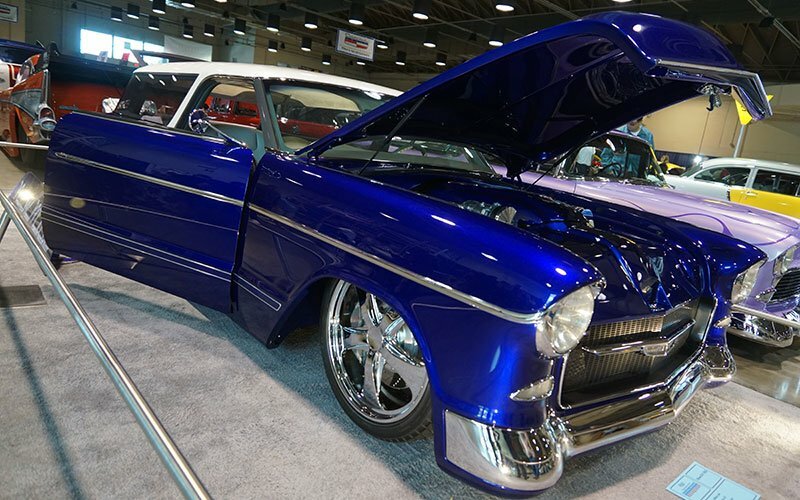 Once again this year, Cars On Line.com covered the 2017 Grand National Roadster Show in Pomona, California for our readers. 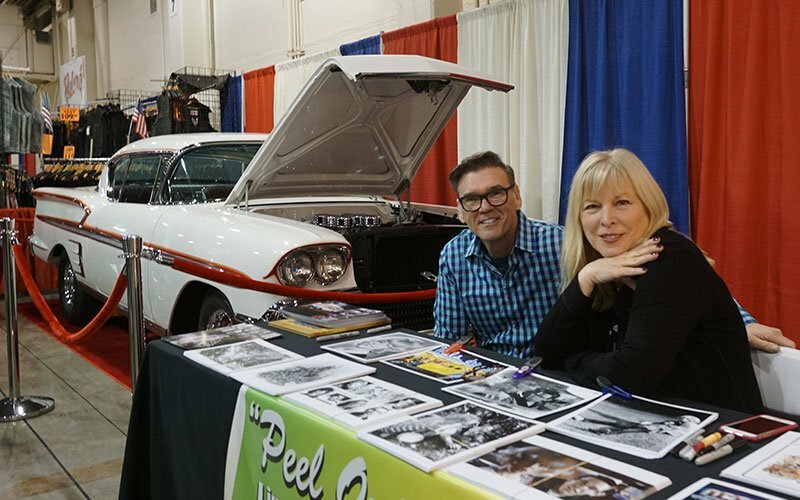 Our photo-journalists Bob and Donna Boberg of eClassicAustos.com supplied the photos and video here in Pomona for the weekend show. 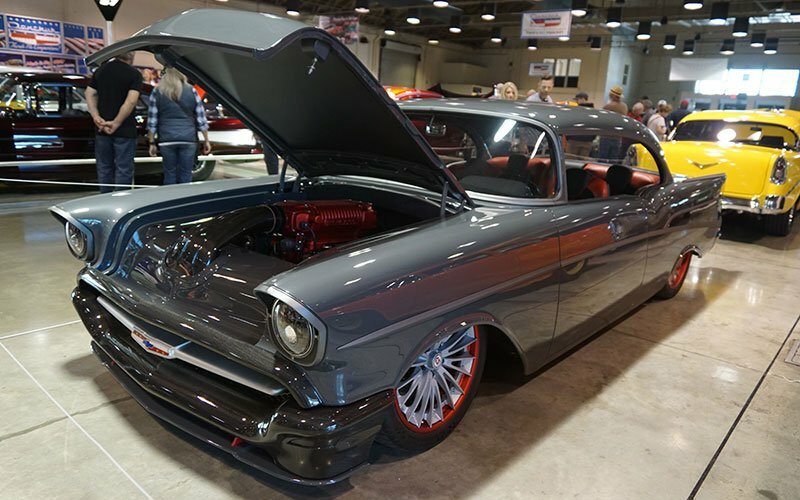 The top cars in the country are here to compete for a place in their class. 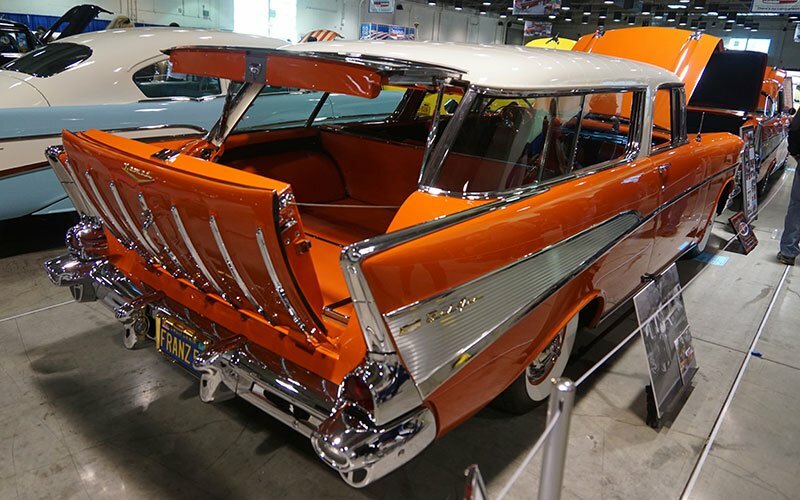 There were 650 show cars on display in ten indoor buildings here at the Pomona Fairplex. 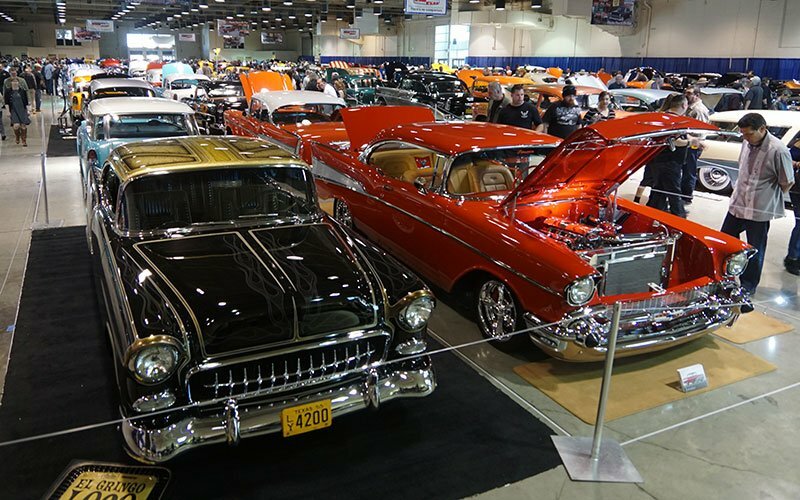 Over 1,000 cars were on display outside. 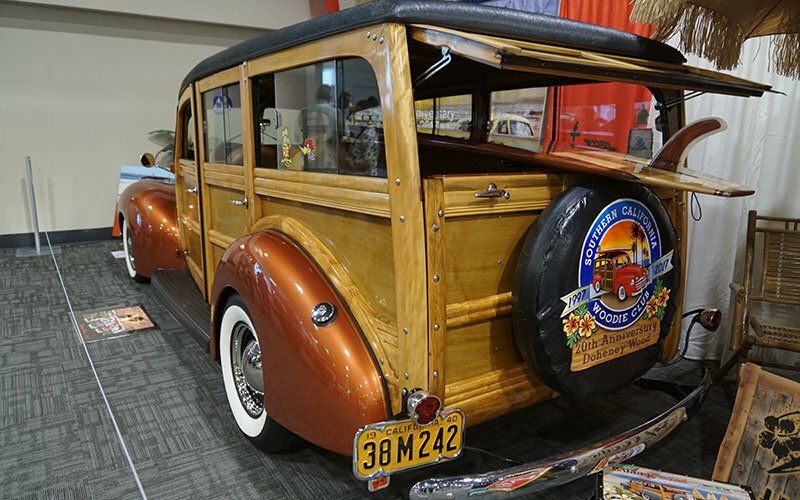 One whole building here at the Pomona Fairplex was packed with Woodies sponsored by the Southern California Woody Club. 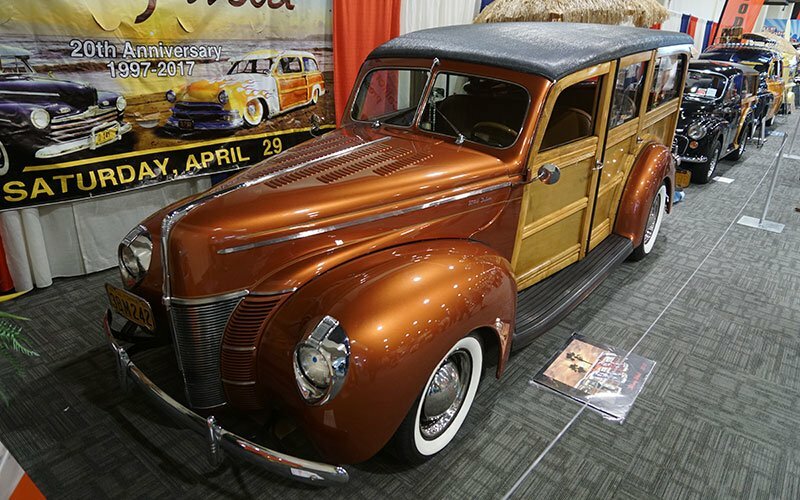 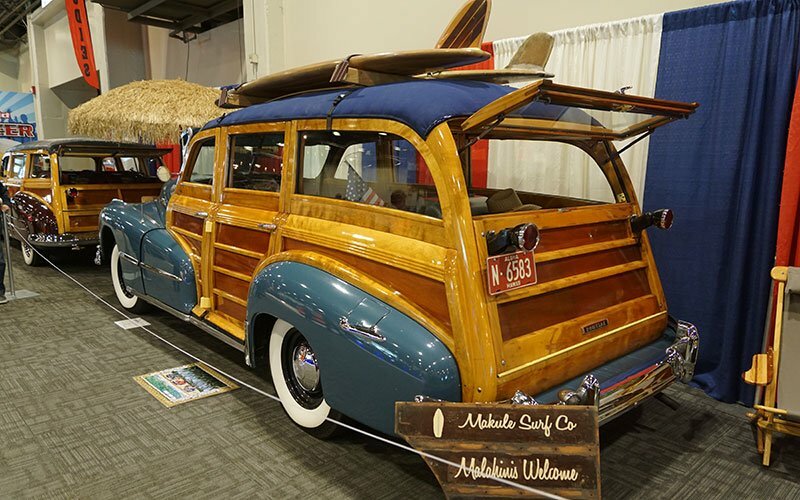 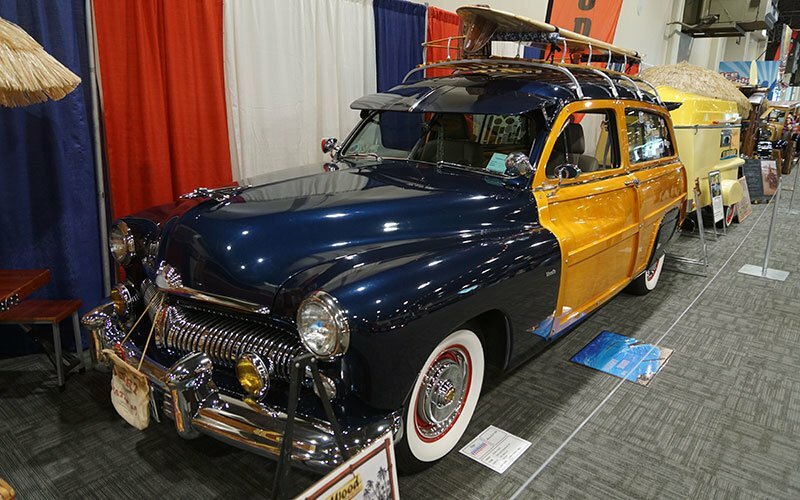 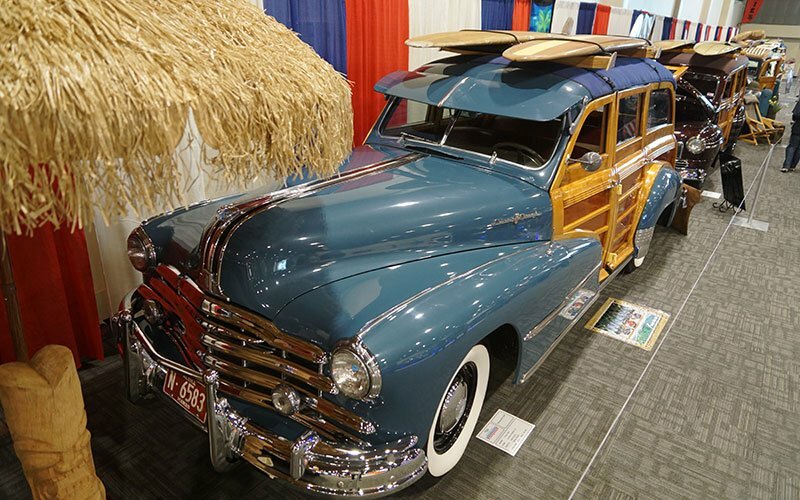 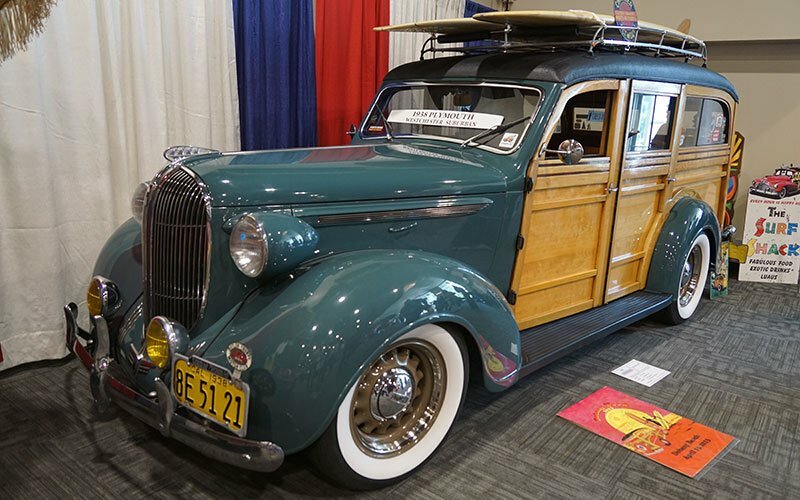 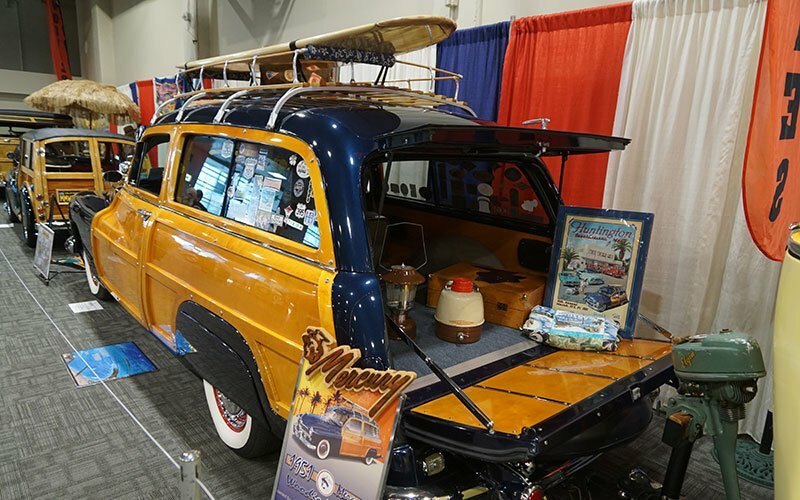 Many of these cars you may have seen at the Doheny Wood or Wavecrest Woodie Show. 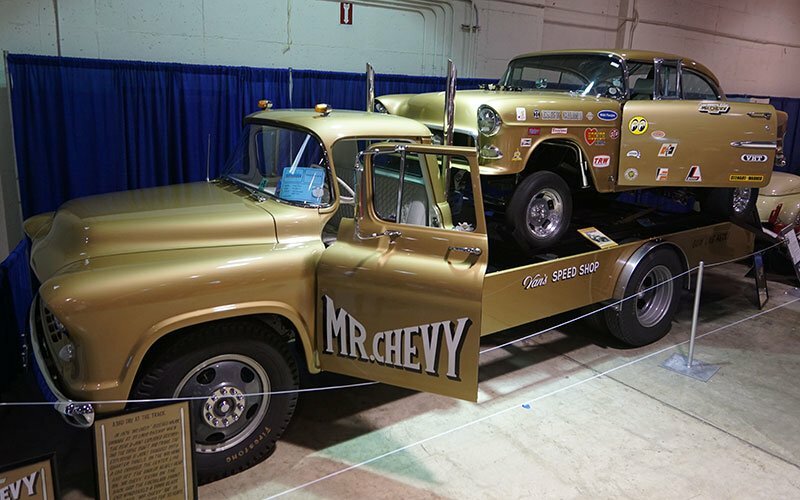 There also was a whole display building at the Fairplex featuring only Tri-5 Chevys. 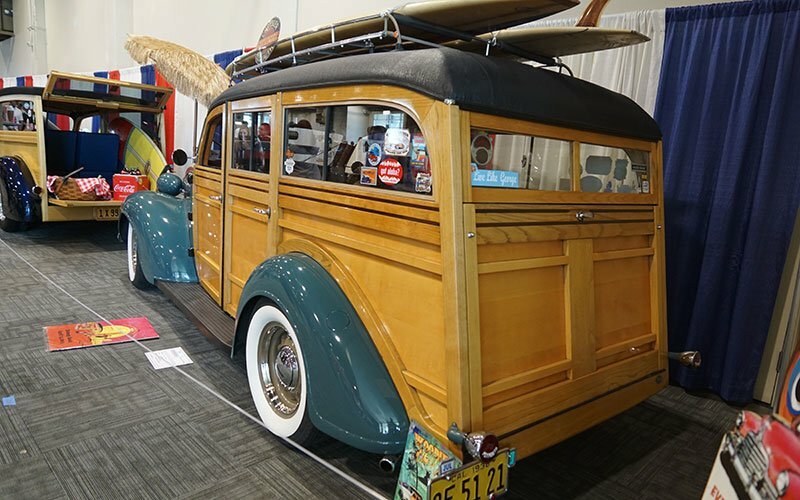 Here is a slide show of what we saw. 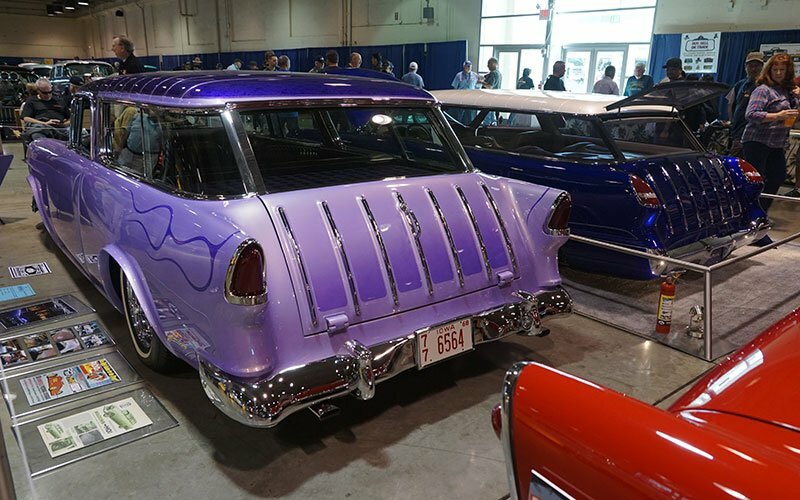 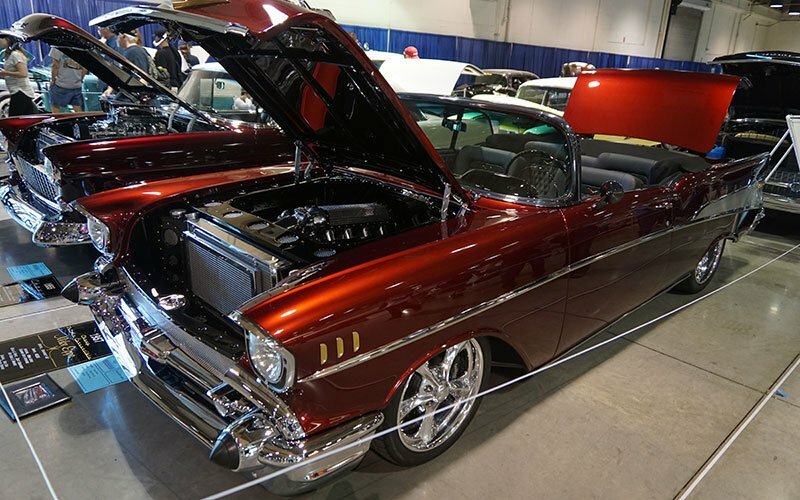 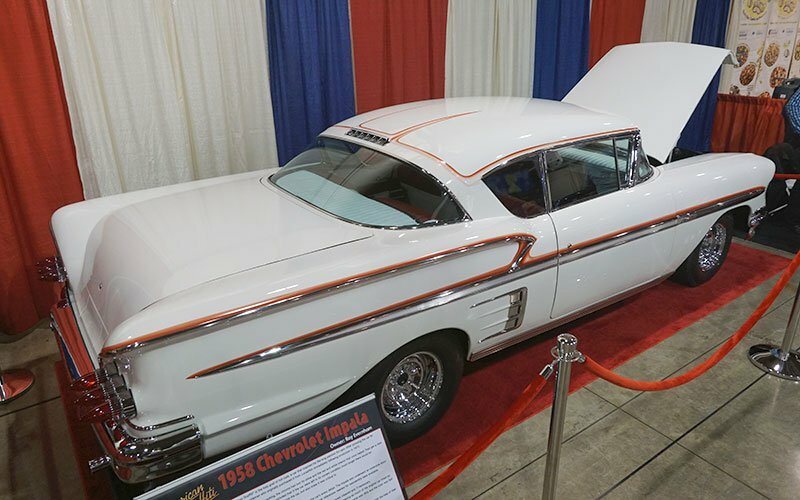 Famed NASCAR crew chief and TV personality Ray Evernham was at the 2017 Grand National Roadster Show in Pomona to promote his 1958 Chevy Impala from the movie American Graffiti. 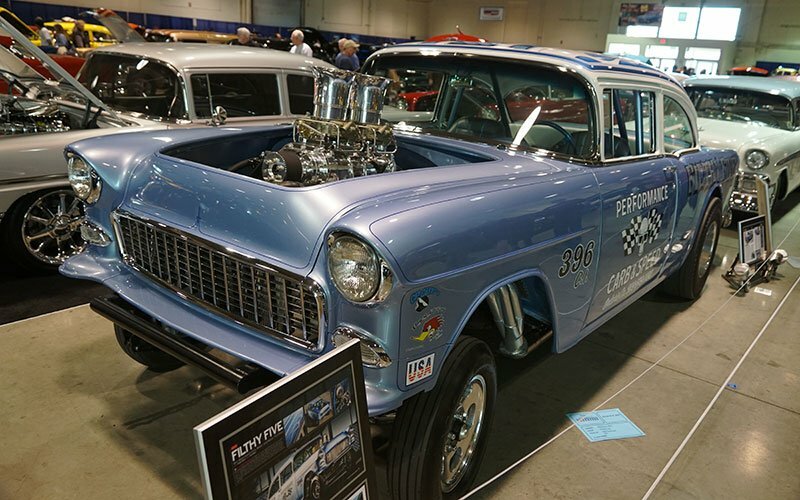 Evernham, after 15 years of trying, acquired the car and has restored it. 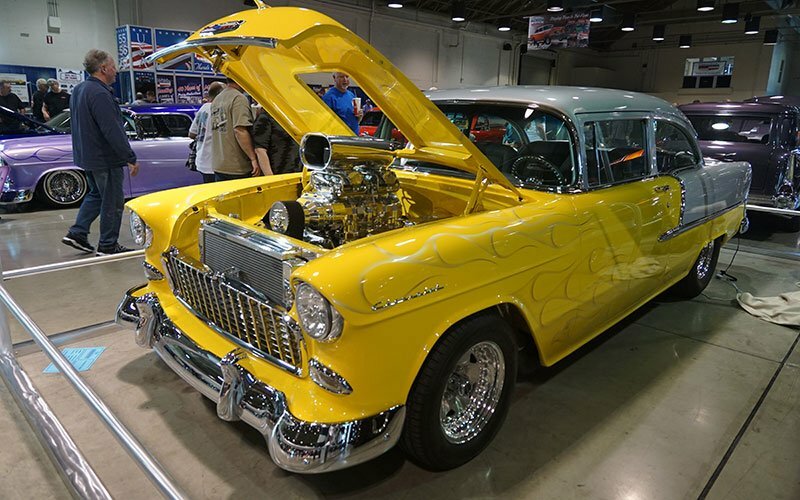 He is shown in the photos with Candy Clark, the blonde who was in the ’58 Impala in the movie.